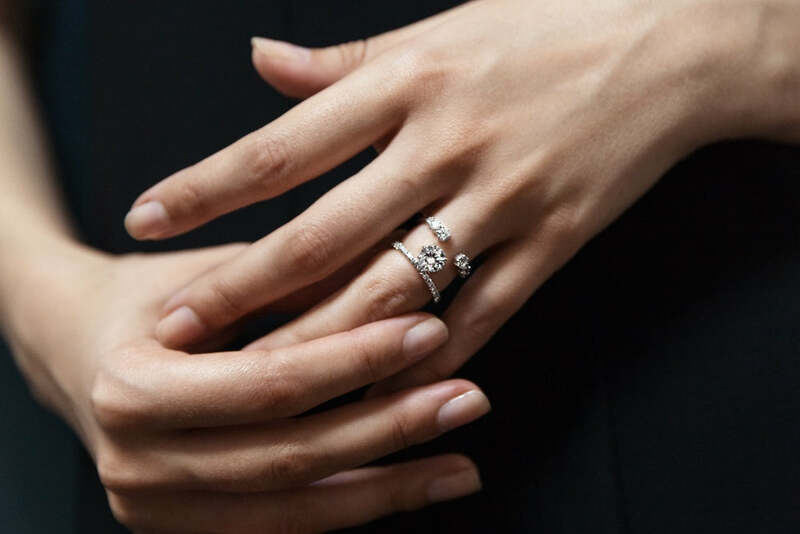 The Forevermark Alchemy™ Collection by Jade Trau is a result of a five-year partnership with Jade and Forevermark, effortlessly marrying the world's most beautiful and carefully selected diamonds with Jade’s meticulous attention to detail and commitment to quality. The Celestial Collection epitomizes the brand's modern, yet feminine aesthetic. Sculptural silhouettes complemented with brilliant diamonds characterize this collection. A classic and eternal interpretation of the expanse universe above us. Motivated by vintage and Victorian jewelry, the Forget Me Not collection is an ode to the designs of a bygone era. Our Forget Me Not pieces incite nostalgia at first glance, while magnetizing the modern woman to its wearability. Putting a distinct spin on engagement rings, our bridal collection is classic yet contemporary. Each diamond ring is deliberately crafted and thoughtfully executed bringing a breath of originality to conventional diamond jewelry. Stacking bands and storytelling are an inherent part of Jade Trau. Each band tells a story and we love being a part of that story. Deeply symbolic and personal, stacking is a simple way to define your style.